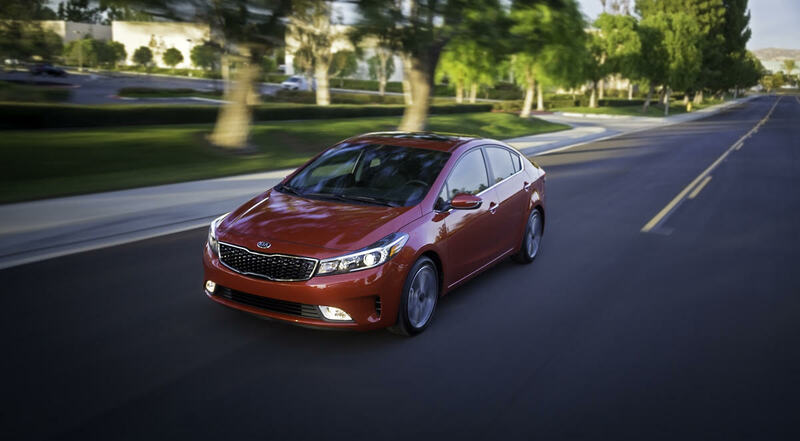 For the 2017 model year, the Kia Forte S got a new front bumper and the “tiger nose” grille has been widened to connect with the newly redesigned headlights, which are available with Xenon HID lights. But our test car didn’t have them. Still, the car had a sophisticated look. It was wide, it had a forward racy stance; it looked quick and here’s what it didn’t look like: a small putt-putt sedan. The Forte S also got a new engine across the trim line. The 2.0-liter Atkinson four-cylinder made 147 horsepower and 132 pound-feet of torque. It was mated to a second generation six-speed automatic transmission that Kia said improved fuel economy and provided smoother shifting. Sounds like hype. But the Forte S did have an EPA fuel consumption rating of 29 mpg in the city, 38 mpg on the highway and 32 mpg combined. And this engine had a little oomph. It moved the compact Forte S sedan smartly; it was quiet and responsive when the accelerator was pushed towards the floor. The car handled well. The electric power steering didn’t separate us from the road. Steering was 2.96 turns lock-to-lock and it had a fairly tight turning circumference of 34.8 ft. The Forte S handled the rough streets here too. It had a McPherson strut front suspension and a coupled torsion beam axle in the rear. This suspension was also sport tuned so the car had a firm ride without feeling harsh. Inside the Forte S was nicely laid out. It had a touch information screen with the audio control buttons at the base of it. Beneath them was the three-dial climate control unit and beneath that was a storage bin with sliding cover. Not only could you house a few small items it was home for the 12 volt, auxiliary and USB jacks. The template over the T-bone shifter for the automatic transmission was piano black. There was a button in the upper corner to select Eco, Sport or Normal driving modes. There was plenty of headroom and elbow room in the front for two passengers. It was the same in the rear. The back seats were comfortable and the floor was almost flat because the car was front-wheel-drive. There was plenty of head room and hip room for two adults although the Forte is listed as a five person compact sedan. A third person can fit in the back seat but it would be snug. Our test car was equipped with the usual compliment of creature comforts. It had satellite radio, voice controls, Bluetooth, cruise control and sport black seats. It was also equipped with Kia’s $1,490 technology package. Included were push button start/stop, autonomous emergency braking, blind spot detection, lane departure warning and lane keep assist and rear cross traffic alert with rearview camera. About the only thing we quibbled about was that it didn’t have anti-glare rearview mirrors or heated seats. But we think that’s a matter of options, well at least heated seats are optional. The 2017 Kia Forte S was priced in the $21,685 range. It was a reasonable sticker for a well-equipped compact sedan.